Be on the same internal network as your rig. If you want to remotely SSH to your rig, you will have to enable port forwarding – which opens your rig to all kinds of people with malicious intent. Your SMOS console will provide you with your rigs IP address – hover over your rig name to see it. 7 – Type in your password – which is your email address that you put in the config file when you started SMOS. Note: linux passwords display black – so you won’t see asterisks as you type. Just type your full email address, and press enter. 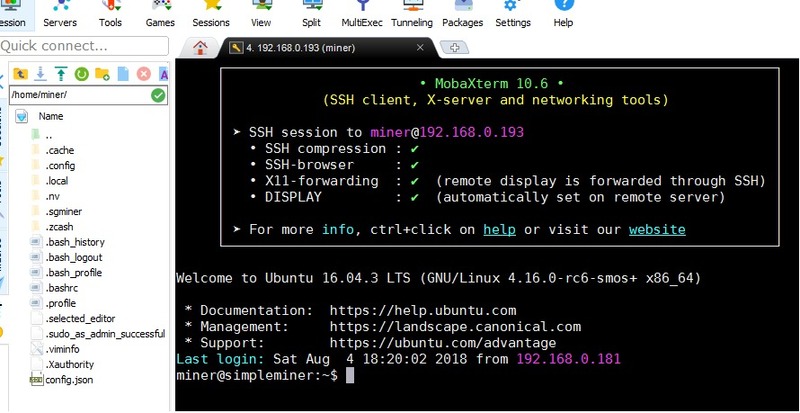 8 – You are now SSH’ed into your rig!